September | 2012 | Can Men Cook? When you are running a training workshop, you don’t really expect to get so many lessons on how to do it properly from the hotel you are running the course in. Nunsmere hall challenged that view. The biggest shock was the positivity of the staff. This should not be the case, but it is all too rare. They were not only smiley and helpful, but glowing in their praise of each other. “You must all try the puddings tonight. The sous chef only does them on a Monday – and his sweets are marvellous. Make sure you take time over the first spoonful. It will be a taste sensation.” You just don’t get that normally, do you? And they were jokey and efficient at the same time. It shouldn’t make a difference to the workshop itself – but it always does, and always makes it easier to make the hard work a bit softer. Yes we were rained in, and flooded a bit, but who cared? We had the extra positive of no phone signal – hurrah! Not available! Great!!! Food was just excellent too. Well done team. You treated us like I suspect you’d like to be treated yourselves. And how many other businesses could learn from that simple truth? The Kitchen Company – Demo! 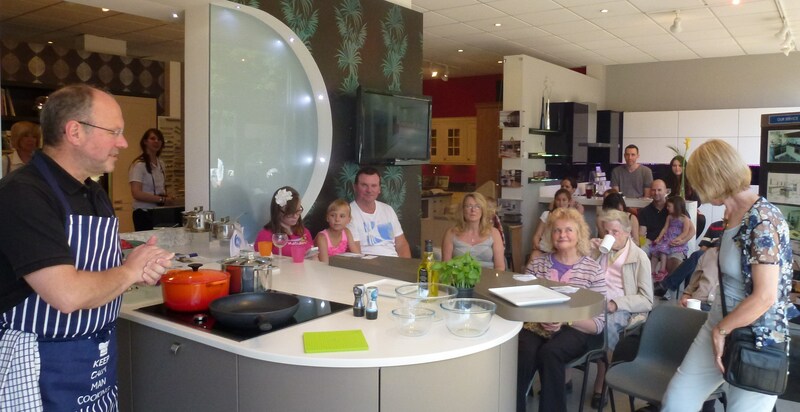 Saturday 8th September saw the grand unveiling of new kitchen displays at The Kitchen Company. They have been established 27 and a half years, and are based on Belmont road, opposite the station in the middle of Uxbridge in Middlesex. 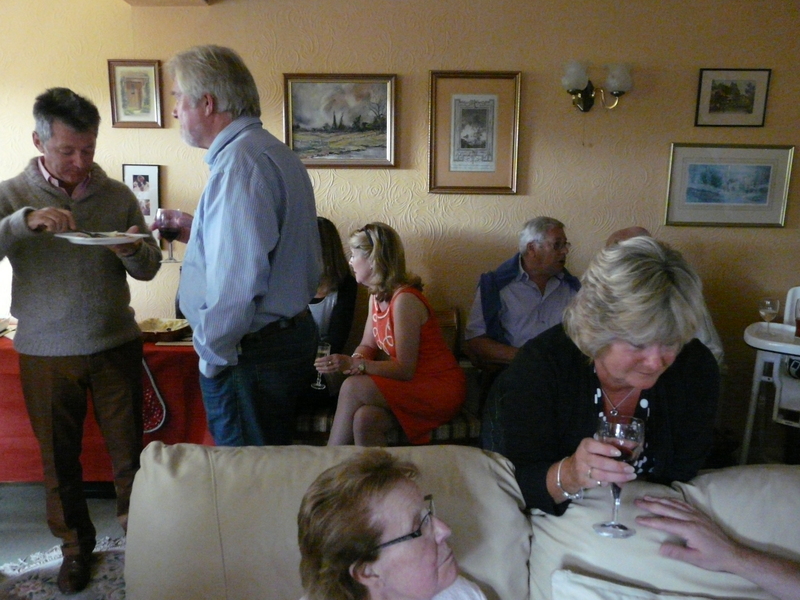 Web site is worth a visit – www.kitchco.co.uk You will find blogs and recipes from me there – because I did a cookery demo for them. We wanted to get over three main things. Cooking from scratch can be easy and quick – and at least you have more idea of what is on your plate! We wanted to show that anyone can do it. And finally, we wanted to show the new kit off! And so they came. We had quite a turnout for the three sessions. On what was forecast by the weather people to be the last nice day for sometime, we were almost surprised at the numbers giving up their time! Firstly, a simple two course fairly posh show-offy style simple meal for two. Our main course was Spaghetti Bolgnese (or Bolognaise depending which part of Italy you come from). The sauce (Ragu) has many variants in each Italian family. I cook it a lot – and even with so few ingredients it is slightly different every time! (Full recipes are on the Kitchen Company website, and my own). But what was different? Well, very lean healthy mince (5% fat); Loads of dried mixed herbs; crushed garlic not added until after the tinned tomatoes ( I never fry garlic, because it goes bitter and too strong the higher the temperature you use – so max temperature is boling water for garlic); a squirt of Balsamic Glaze (Sainsbury and Tesco have this); and a few leaves of ripped fresh Basil. These are not major things, and the whole takes almost no more time than opening one of those jars you can buy. But, just look at the ingredients next time on that jar. At least yours will have no preservatives or e numbers! Secondly, Orange Infused Chicken Liver Pate with Griddle Scones. This is the dish I cooked on ITVs “Britain’s Best Dish”. It won me that episode. It’s on my You Tube channel, and in the book. Gratifyingly, this went almost instantly. The main course was Salmon, steamed in a frying pan. You cook the fish both sides by frying in a mix f olive oil and butter (nicely lowers the fryng temperature0. At that stage, I add a good squeeze of lemon, some balsamic glaze, a teaspoon of soy sauce and a spoon of honey, and then put the temperature down (easy on the very posh induction hob at the show room), and put a lid on the pan. Served with cous cous with loads of fruit and nuts and lemon added.. Again, this is as posh as going out to eat. Fianlly, we had a bit of funwith Brownies (a bit frisbee like, because I didn’t put two eggs in, only 1 – doh!) But luckily, there were some I had made earlier. 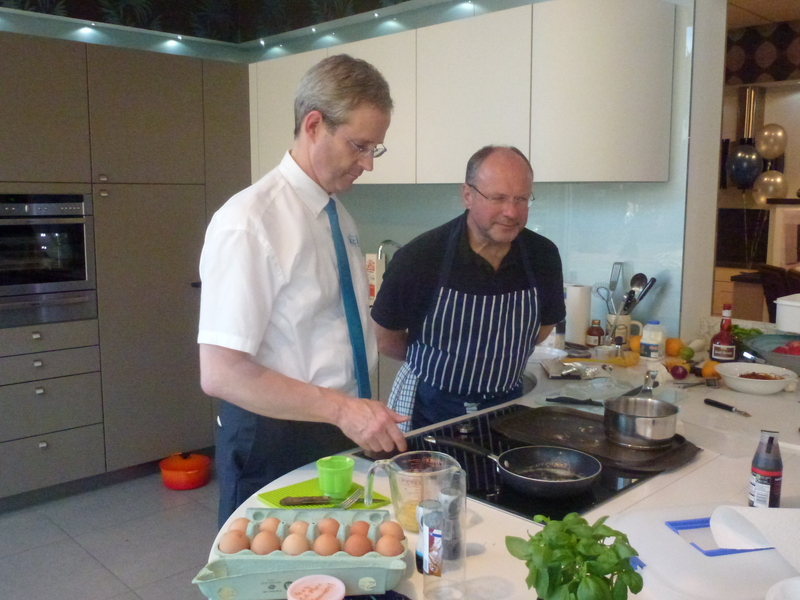 Then Chris, who is the boss of The Kitchen Company was brave enough to join me on stage to make the perfect omelette. All chefs say if you can do this, you can cook anything. the secret? Very little mixing, and getting the right temperature. You will have to visit their site to see more! And my blog, and the book. (via Can men Cook).